Construction on the Pisa Tower began in August of 1173. At this time in history, Pisa (and Italy in general) was going through a period of military success, which means that money was flowing readily. During this first building period the foundation was laid and the first floor was constructed, according to the plans of the original architect, Bonanno Pisano. In 1178, constructed stopped. Although the tower was nowhere near finished, the War with Firenze broke up, causing the men working on the tower to enlist in the army and leave the construction site. This was the year the lean first became noticeable. Within the next ten years, the first three floors were added, but war once again got in the way of the building of this beautiful tower. Over 100 years late, designer Giovanni di Simone began construction once again, adding three more layers to this leaning layer cake, and by 1284, the tower was considered finished at long last. Simone attempted to correct the leaning problem by building one side of the wall higher than the other, and for this reason, the building is, in fact, curved. The tower still continues to sink every year, under the watchful eyes of scientists who are ensuring that the structure is still safe. Although the ground is still swampy below the tower, it has settled greatly from its first days of construction so that it only now sinks about one or two millimeters per year. It is quite safe for tourists and it would be a shame to visit Italy without stopping by this grand architectural masterpiece. Over the centuries, people have done studies on the tower and some have even attempted to stop its lean. As rule, Benito Mussolini ordered that the tower be fixed, and worked attempted to achieve this by pouring concrete into the base foundation. However, this did not cause the tower to tilt vertically, as Mussolini had hoped. Instead, it simply made the tower heavier, causing it to begin to sink even farther into the swampy soil below. 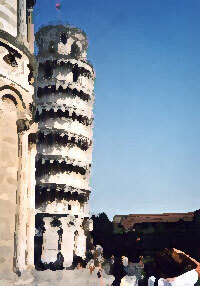 In the mid-1960s, the town of Pisa and Italy as a whole began exploring options to keep the tower from tumbling over. However, it was very important to historians and government officials alike to maintain the tower's signature tilt, as this is what has created its fame over the years. Without the tilt, tourism in Pisa would drop significantly. In 1990, after decades of studying the leaning landmark, a team of engineers, mathematicians, and historians decided to close the tower to the public for a number of years to work on stabilizing the lean. The building was actually closed for well over a decade, and the people living in the surrounding areas were vacated. They also used cables to secure the tower at the third-floor level, and they removed some of the weight by taking the bells out. In December 2001, the tower was reopened and declared safe and stable for at least 300 years. During the restoration project, the team considered a variety of options and decided to decease the lean by removing soil from the elevated side. They discovered that much of the lean was due to the actually stonework and building materials used to originally build the tower. The tower itself, if you can get past the novelty of its leaning shape, is quite beautiful. If you're so inclined (no pun intended), you can follow the almost 300 steps inside the spiraling tower to the belfry. From the top f the tower, you can look over the city of Pisa, and on a clear day, you can see quite far. The Pisa Tower is a Romanesque style of architecture, in keeping with the era when it was built. It weighs a bit over 14,700 tons and has walls that are 8 feet thick at the base. At the top of the tower, the bells are housed. There are seven bells in total, cast over hundreds of years from 1263 to 1654, and they are tuned to the typical musical scale. A number of events allegedly happened at the Pisa Tower, although some were never officially recorded, so it is impossible to know if they actually took place. Galileo was rumored, for example, to have dropped two cannon balls off of the tower on different sides to measure their mass and speed. One tale that is confirmed is the use of the tower as a Nazi observation tower. The United States' decision not to strike save the tower ultimately, while it would have otherwise been defaced and possibly collapsed. While visiting the Leaning Tower of Pisa, don't forget to check out the rest of the town as well. The city is home to a number of other attractions as well, including Knight's Square, the churches of St. Sixtus and St. Francis, The Medici Palace, the Borgo Stretto, and Palazzo Reale (the "Royal Palace"). This is really a beautiful, old city and well worth a visit on your tour of Italy.